Island hopping in Siargao? Book THIS guy! There’s something very Robinson Crusoe about island hopping and exploring small, white sand islands surrounded by turquoise, glistening waters. It shouldn’t take much to convince anyone to hop aboard the next boat setting sail to discover new charms and secrets either. Siargao is this gorgeous island, one of roughly 7,000 in The Philippines, and it’s surrounded by equally as gorgeous islands that you must visit and let’s face it, no trip to Siargao is complete without a day trip out on the water. 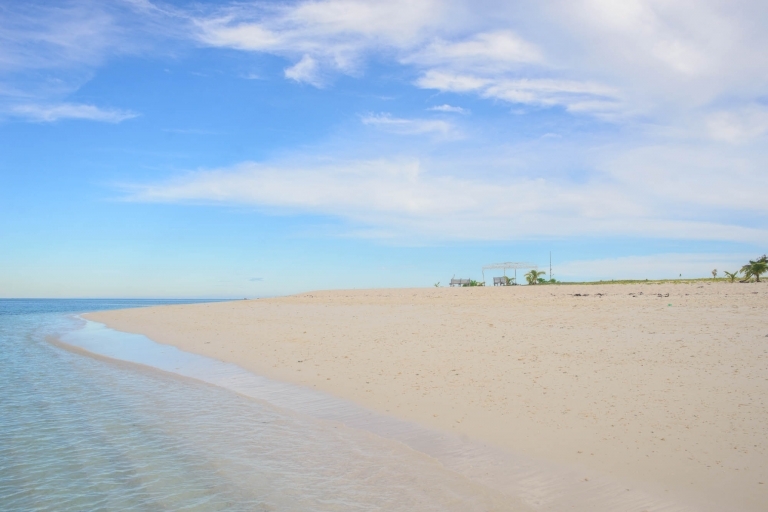 Just some of the islands you can visit include: La Janosa, Naked Island, Daku, Guyam, Mamon, Casuelo and Bucas Grande. There are many others in the vicinity too so just ask your guide which ones would suit you best. How many islands or which ones you visit are up to you and the price is altered accordingly to how many you want to visit and how long you want to spend on the water. We, of course, opted for an ALL DAY excursion and we asked to visit five islands. Bebet is the owner of the boat and your tour guide for the day. He speaks Filipino, English & Spanish. Bebet is a really nice guy, he is not part of a large tour agency and his tours are much more personal in his desire to seek you out somewhere off the beaten track. Please remember this is a personal recommendation, so please be polite to him. You all know that I really believe in supporting the communities we visit and by hiring a local guy who lives there, I know that the money is directly benefiting the local community. I think it’s crucial to support the local community because I know how easily mass tourism can exploit and destroy them. 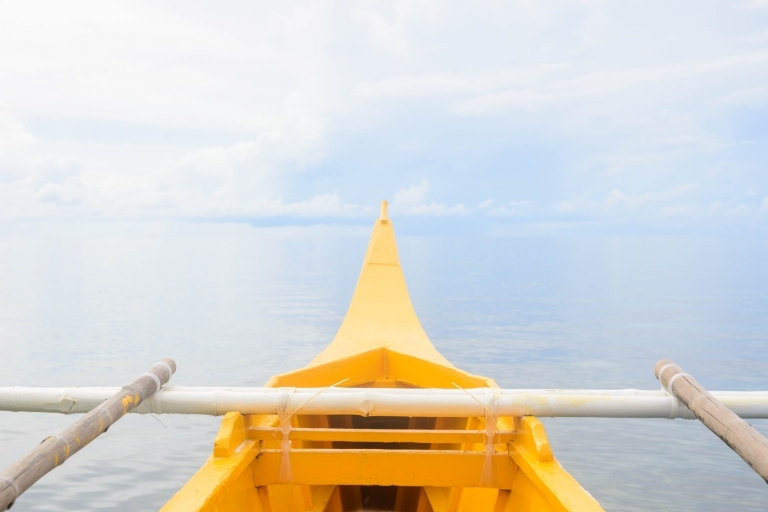 The boat is moored in a residential area of General Luna. Bebet will let you know exactly where to meet him. In order to beat the crowds on the islands and to maximise our time on the water we met him quite early in the morning. I was apprehensive about the weather as we had large clouds and droplets of rain but even if it rains in Siargao it’s still warm and magical. If you have a threat of rain, don’t worry too much as it tends to pass pretty quickly (if you’re not in the rainy season lol). Although it has a reputation for being the best island to watch the sunset from, Guyam was the first island that we visited. The clouds were thick, the sun lacking, but regardless, the water was charming and warm! We had been warned that there was an fee of 10php per person however we were not asked for payment and we didn’t spend longer than about 45 minutes here. One local man in a hut usually keeps watch and I am told he will scale a coco tree and grab you a coconut for 50php. Guyam looks small but its waters are surprisingly deep and full of fish and large shells. The water around the island is crystal clear and a big reef surrounds the entire island. It’s the largest reef I’ve seen so close to the water’s surface and so easy to access. The original plan was to dock at Lajanosa after Guyam however as there were already a few boats of tourists on it, we decided to carry on past. Eager to escape that package tour mentality we headed straight for Mamon which appeared deserted. Mamon is considerably bigger than Guyam and the first glimpse I caught showed a house perched on the beach-side with a fallen coconut tree. 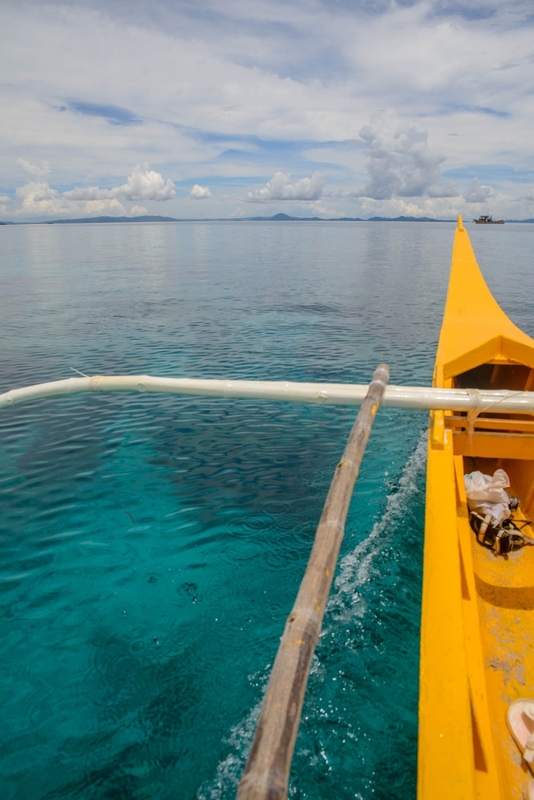 There are roughly 5 houses on Mamon which are owned by local fishermen and their families. I have read that for a small fee of 300php they will build you a fire and cook you a meal (if you provide the food) although best to discuss this with Bebet as I don’t know the details. If you’d like to camp on either of these islands, you’ll need to provide everything but you can ask Bebet for recommendations on what to take. There is just a small channel separating Lajanosa from Mamon but I was warned against swimming across it due to the current. Instead we hopped aboard the little boat and Bebet drove us in style. It takes roughly 45-60 minutes to get to Lajanosa from Siargao which is possibly why it isn’t as popular to visit but for me that really adds to its charm! We were the only people on it and we stayed approximately three hours. Lajanosa was definitely my favourite island and the island we spent the most time on. I found it the most interesting because of the level of wildlife on it as well as the unusual rock formations which are home to jumping crabs. We sat on the rocks sheltered by the trees and ate our picnic lunch, lounged on the beach in the sun and then explored the calm waters. Upon arrival, you have to pay a 100php docking fee, so make sure you take cash. You can also hire the beach huts which are spread along the beach and buy food and drinks. Although Daku was the most colourful island it was also my least preferred. It had a much more touristy but alcoholy feel about it that made me feel uncomfortable. I decided to take a walk on the island to see what I could find and I came across a dug out pit where there must have been over a hundred glass alcohol bottles. I felt myself being more on edge here even though the water was spectacular. Rumour from the main island is that when the police come looking for local lads in trouble, they hop over to Daku and hide out, getting drunk! I can’t substantiate it though. The water here is no different from any other island; amazingly clear, warm but you have the ability to go quite a bit deeper if you want as the reef is further out. The only downside is the amount of boat traffic in the area albeit slow. At the end of the day, we chose to watch the sun setting from Naked Island, a bare, sand island with small areas of patchy grass and a gazebo. There isn’t anything to see on this island at all, it is solely 100 meters of sand but that is the beauty of it – for a short period of time at least. No naked people, PHEW! You can walk or swim around the island in its sheltered waters which are incredibly warm. Because it was almost sunset we hung out on the beach here and our long-tail boat was the only sign of human life, giving the feel that we could have been stranded on a remote island….with a boat. Take cash for your docking fees. If you’re worried about cash, read our post on how to send yourself money whilst there. There is no fresh water on any island so make sure you take enough drinking water for the day. The only island you can buy food on is Daku. You might want to consider taking a picnic. There is little shade on the boat and in the water so take a reef friendly sun-screen or a UV rashie top. If you want to explore the islands you’ll need beach shoes. Take or rent snorkelling stuff. Definitely a must because there’s lots to see down there. Water does splash up off the boats so best to take a splash-proof bag. Towels will keep you warm at the end of the day when the boat is going faster. Don’t forget your camera/drone/GoPro ! You could get a boat trip to the northern Sugba Lagoon; or maybe take a dip at Magpupunko Rocks; you could hang out on the beaches; or just chill and eat delicious vegan food. 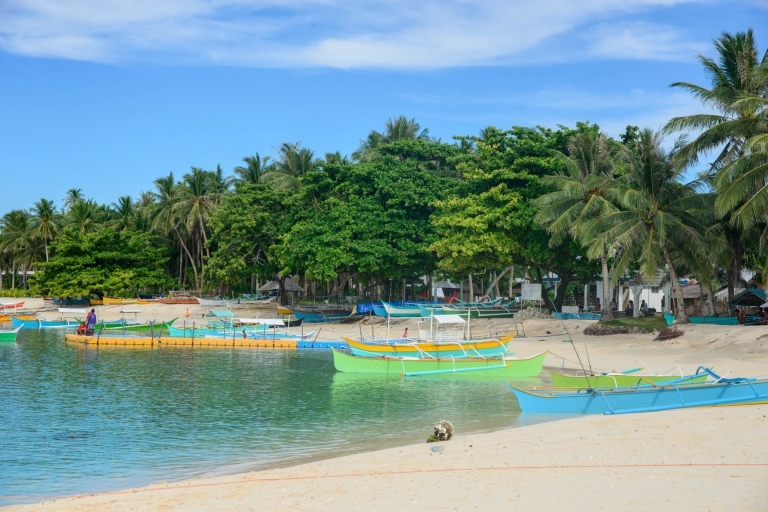 Fancy island hopping around Siargao? You should definitely add this to Pinterest!